There’s no greater accomplishment than earning both the clients’ and editors’ stamp of approval. 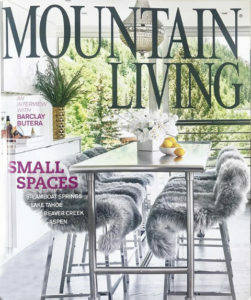 That was just the case with this condominium remodel, recently featured in Mountain Living​. Last year, a New York-based couple, who purchased the condo as a second home, hired us to help them reimagine the very disjointed structure. Originally two units that had been united as one, this space did not inspire the couple, but they couldn’t help but fall for the classic views and unparallelled location at the base of Aspen Mountain. To make the most out of the two-bedroom home, we created a new floor plan and collaborated with ​enlisted Aspen-based contractor Craig Barnes to tackle the the slope of the floor. CCA’s Marina Skiles worked closely with the homeowner to create a soothing, neutral color palette and thoughtful furniture selections that maximized the condo’s full potential. The result is a clean, streamlined pied-à-terre perfect for winter vacations spent on the slopes. To read the entire article, click ​here. This entry was posted in Featured, Industry News and tagged Architect Colorado, Architect in Aspen, Architect in Colorado, Aspen architect, Aspen Colorado, CCA architect, ccaaspen, Colorado architect, Colorado architecture, condo remodel, condominium, Contemporary design, Marina Skiles, Mountain Contemporary, Mountain Living, Mountain Modern, pied a terre. Bookmark the permalink.